Surf Lakes which is located at Queensland, Australia is set to introduce a one of a kind man-made surfing pool in the world! 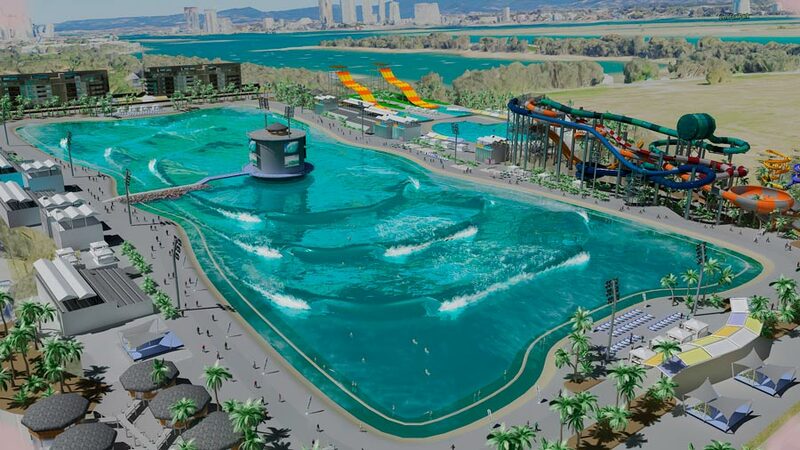 Surf Lake developed a unique technology that producing up to 2,400 waves per hour in the world’s biggest surfing lagoon. The technology has been developed at a private demonstration facility by a team of Gold Coast local and the organization is getting set to open the world’s first man-made wave pool. The ultimate goal is to create 5 different waves at the same pool! 1. So, how it started ? Surf Lakes team has been working hard to complete the full demonstration facility since 2 years ago. The original plan was first thought up by Aaron Trevis, when he threw a rock into water and as the ripples broadened outwards, immediately he came out an extraordinary thought for brand new surfing concept. Thanks to Surf Lakes International, after years of dreaming, designing, testing and building, his idea is currently being tested in Yeppoon Queensland. 2. Beginners or the pros? Surfers ranging from beginners up till the professionals will be able to enjoy the incredible breaks without the pain of having to fight for their spot on a wave. The quintet of breakers vary in terms of difficulty, size, and length. They are all actually all differentiate by colour-coded, therefore beginner surfers through to moderate and advanced wave riders can get the most out of their experience. 3. What kind of waves do they have? The technology can boast five levels of waves at the same time and they’ll all peel off around a manmade lake. The five levels of waves are: Novic, Intermediate, Advanced, Expert, Pro. Surfers can have the opportunity to check out the pool’s “5 wave technology”, which produces five different levels of waves all the while. It allows for learners, experienced surfers and, of course, the pros to surf perfect waves, all at the same time. 4. How does it works? The creation of waves is made by a giant plunger at the centre of the lake that produces one pulse every six seconds to send the water rippling in all directions. The plunger is fit of creating 80 rideable waves per minute, or 4800 waves per hour, as indicated by Magicseaweed however for the time being will be kept at half capacity. The machine and park design will produce a variety of waves, which can suit surfers of different skill at the same time. In the very simplest of terms, the machine moves up and comes down so it pushes water out into the lake and, through some variety of engineering magic, creates perfectly shaped waves, but also different types at the same time. 5. Where it is located? Surf Lakes located near Yeppoon on Queensland’s Capricorn Coast, a coastal town near the larger Rockhampton, approximately an hour’s flight north from Brisbane.